Unisex Short Boot Socks is rated 4.5 out of 5 by 377. 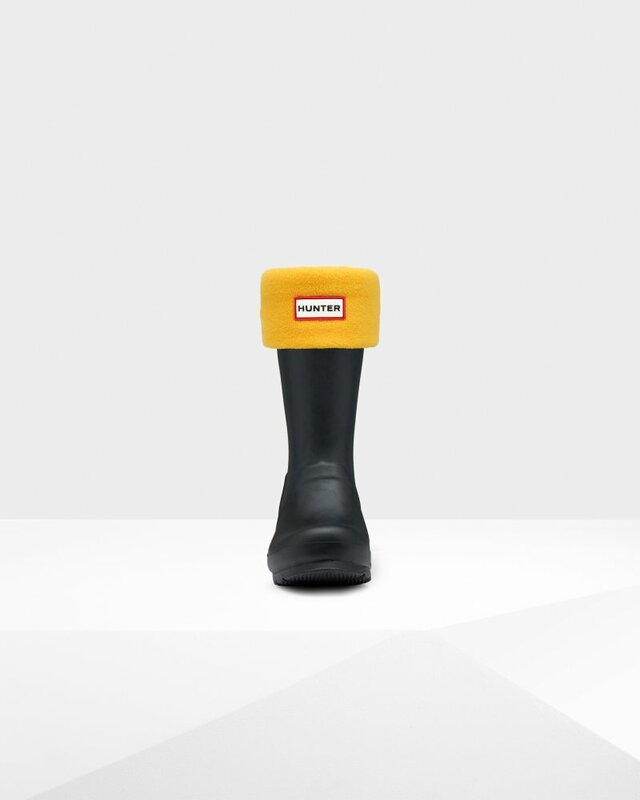 Designed to be worn with Hunter Rain Boots, these cozy boot socks offer comfort and warmth while enhancing the fit of the boot. Rated 5 out of 5 by NiNa831 from Great Fit I bought these for my Gloss Black Short rain boots. Perfect Match. Rated 5 out of 5 by Kafi from I love my boot socks!!! I purchased my red boot socks online after I had purchased my "red" short boots. I simply love them, they are a perfect fit and so comfortable. I always wash items which I purchase, I was so happy that my "red" did not bleed. I believe my boots and my boot socks are great! They go perfect together and they are good quality. Rated 5 out of 5 by SoniaPgh from Fit other brands! I have a pair of rain boots of an unknown brand and these socks turn the boots into warm snow boots, perfect for a quick walk to the mailbox, shoveling the driveway, or walking the kids to the bus stop. So warm! Polyester, like a thick fleece pajama for your feet. A great value! Rated 5 out of 5 by susanrf from Essential for the boots. Far more comfortable and it helps the boot fit better. Rated 5 out of 5 by Buffbay from Warm The shock is warm and comfy. I would recommend u get a size up in shoes . They will make it tight fit if u get the exact size u usually wear. Rated 5 out of 5 by Jennifer from Exactly what I was looking for ❤️ I bought the hunter short rain boot in your store and you didn’t have in stock the color of Hunter boot sock I wanted. So I ordered them on line and they came faster then I expected and was more pleased with the color. Love them both so much. They were a Christmas gift for my daughter and she loves them both more then I do, if that’s even possible!